Motichur Laddoo are ball-shaped sweets popular in the Indian Subcontinent. 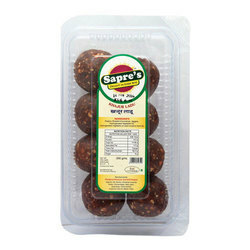 Laddus are made of flour, minced dough and sugar with other ingredients that vary by recipe. They are often served at festive or religious occasions. We hold expertise in trading and exporting a quality approved range of Laddu that are processed using natural ghee and ingredients by our vendors. We offer the entire product range in different sizes and are acknowledged for rich taste. They are considered as the token of prosperity and are used in different traditional ceremonies. Moreover, we offer them at most affordable rates. Being a leading enterprise of this industry, we are offering a huge range of Sweet Churma Ladoo. Ingredients: Gram Dal, Sugar, Ghee, Green Cardamom. Leveraging the skills of our qualified team of professionals, we are instrumental in offering a wide range of Gram dal Sweet Balls. FREE SHIPPING For Normal Delivery Above INR 600/- Only.